This Barnes & Noble exclusive edition includes a letter to Jace from his father! The New York Times bestselling Mortal Instruments continues—and so do the thrills and danger for Jace, Clary, and Simon. Can the lost be reclaimed? What price is too high to pay for love? Who can be trusted when sin and salvation collide? so we were left off from book 4 with quite a problem on our hands weren’t we? greater demons were killed, suprise visitors/villians return, things happened to characters that we prayed wouldn’t…evil over took the souls of the souls of some of the good and yet we still really want to believe that there’s a way to come out of this on top. 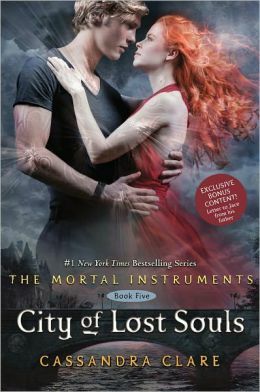 Let’s just say that i’m really happy that City of Lost Souls was already out otherwise i don’t know what i’d do with myself right now. the lightwoods, magnus, clary and simon and friends just won’t give up trying to find him because they just know that he can’t be dead. Clary aligns herself just a little bit with the seelie queen to find out a little of what she needs to do to find Jace, and even more trouble ensues. it woudln’t be a TMI book if Clary didn’t throw all caution to the wind. She tends to leap without looking. Also, we find ourselves yet again in a place where Simon is a hero and needs to do it again. 1) what’s going to happen to Jace now ? seems like there are after affects of what happened to him and i wonder what that means? 2) what’s going to happen with Alec and Magnus ? things can’t quite be what they seem right? I HOPE NOT! 3) what’s going to happen with Izzy and Simon? 4) are things going to be smooth sailing for Jordan and Maia? and a big question i have is…. is Alec really a herondale???? why did Camille keep making reference to Will and how much Alec looked like him? brother zachariah – what’s his ties to the herondales? is he really stephan who was thought to be dead?…just wondering since he’s sooo insistent on doing what he can to save any relative of the family. This entry was posted in fantasy and tagged alec and magnus, Angels, Cassandra Clare, city of lost souls, Demons, Jace and Clary, simon, the mortal cup, The Mortal Instruments by iscm13. Bookmark the permalink.